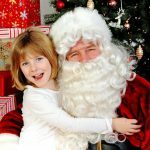 Hometown Holidays Events in The West Seattle Junction on Sunday, December 2nd from 11am to 3pm include: Meet Santa, Mule Carriage Rides & More! Santa is coming to The Junction to listen to your children’s Christmas requests at City Mouse Studio and Store (4218 SW Alaska). Bring your camera! Santa and his helpers are here! No photographer but the stage is set for meeting Santa and capturing your own special moment. The Junction Association will donate 100% of your donation to West Seattle charities. And be sure to enjoy Mule Carriage Rides with the family as well! Take a traditional carriage ride down California Ave pulled by beautiful Belgium Draft Mules. Hometown Holiday Headquarters will be located in front of Key Bank for festivities, fun for kids, and information on shopping, the Holiday Raffle, and neighborhood events. Check our Holidays page for more information about other holiday events, shopping and dining in The Junction.